Free Download AD-Aware Free Antivirus+ latest version from direct download link. It is a full fledged antivirus, firstly Ad-Aware antispyware was introduces then LAVASoft has finally released its complete antivirus. It is developed by LAVASoft. This is the 30 days free trial version. It protects your computer form all type of wares. AD-Aware Free Antivirus+ has two options Basic and Advanced protection areas. In free trial, it has the Basic protection and in advanced protection area there are a lot of things, internet security, email protections and all that. It has a user friendly interface. It occupies very low space in system. However, it will slow your system’s speed initially when it’ll ask for scan. 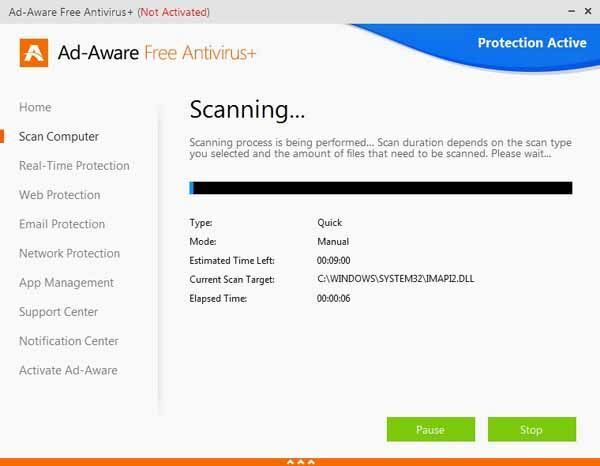 AD-Aware Free Antivirus+ has three types of scan; Quick, Full and Custom. The most important and interesting option is custom which allows you to customize the scan process. You can also set schedule for your scan. AD-Aware Free Antivirus+ has three types Pro, Professional and Security. Basically they all are same but, if you want enhanced features then go to further versions which is great thing. There are some other option too which are under Protection Settings and under Options. With the help of under protections setting, you can do the real time protection of system and browser. There is another option of safe browsing which helps you to save from internet attack. What are the changes with new version of Ad-Aware Free Antivirus? Ad-Aware Free Antivirus+ has a lot of changes with this latest version. Now, it has the latest firewall technology which will be turn on automatically. It has real time protection which enhances the performance and reliability of system. It gives you now, the browser security and which will be updated automatically many times.